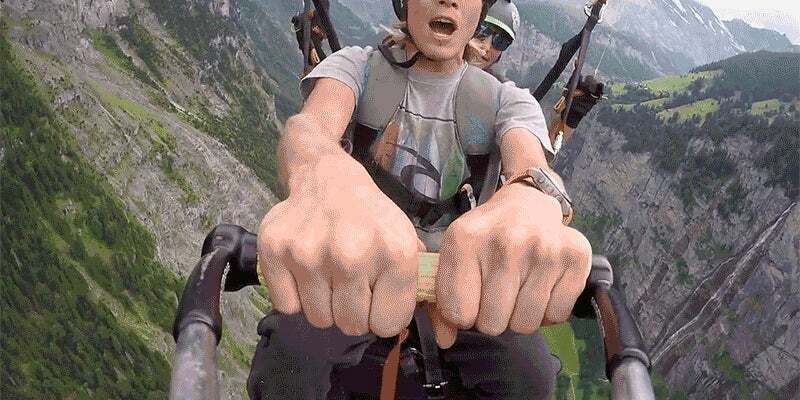 Video: Not content with hopping aboard a tour bus or renting a helicopter, professional base jumper Quentin Luçon figured the best way to see the Swiss Alps was to hang from a giant swing suspended below someone gliding over the majestic mountain range with a parachute. The view is undeniably spectacular, and Quentin was mostly safe during this stunt thanks to a parachute strapped to his back. In fact, that's how he got back down to the bottom of this valley after a short free-fall. Convincing tourists that this is the best thing to do while visiting Switzerland might be a hard sell, but then again, New Zealand convinced people to jump off bridges with a giant elastic band strapped to their ankles.